When I entered into this agreement with JC Golf, I had played all their North County courses except one – Oaks North. I’d heard good things about the 27-hole executive course in Rancho Bernardo, and every time I drove by it always looked to be in fantastic shape, but I just hadn’t had the opportunity. Well, that opportunity arrived last Friday, and I have to say that I enjoyed this course very much. I’ll play an executive course on occasion to focus on my irons, wedges and short game. By that measure, Oaks North gave me everything I was looking for. On that note, I thought I’d highlight the five things that made my round at Oaks North valuable and enjoyable. You come to an executive course to make birdies, which I did, but the unexpected bonus was the amount of wildlife on the course. Song birds and water birds abounded. Having only lived in California for about 18 months now, I’m still amazed and amused by the variety of wildlife here. The highlight of the round came on the third tee of the South Course at around 9:30 a.m. As we were approaching the tee, a white heron was on the box. Rather than be spooked by our approach, it lingered on the box for about 5 minutes before casually strutting off into the landscaping. I very much value these small encounters with nature and think they add a great deal to the golf experience. My first golf birdie came on the next hole when I drove the green on the 260-yard 4th and two-putted. I carded three birdies in my round but would’ve had twice as many I’d made a few more putts. The greens at Oaks North were in great shape and provided just enough of a challenge to keep things interesting. You don’t get any severe breaks or pin locations at this course, but you do get enough break in your putts that you’ve got to make a good read. These aren’t the no-break tabletop greens you find at some executive and municipal courses. I only hit the same club on consecutive tee shots once. I had 8-iron on back-to-back shots on Nos. 5 & 6 on the North, which might not have been the case with a different wind or another pin position. Otherwise, the tee shots varied nicely and worked most of my bag. I played two holes that were over 300 yards, just enough to air out my driver. There’s actually more distance here to work with than at a few other executive courses I’ve played in the area, which is nice. I’ve been known to have a sweet tooth at the turn and frozen Snickers is my snack of choice. Oaks North has them. I always think a little more highly of course that thinks to stock frozen Snickers. Well done. I did not walk the first time, but I will the next time. I enjoy walking my rounds and wish I had more options in the area in that regard. Oaks North is an ideal place to carry your clubs, or grab a pull cart, and enjoy the walk and take in the scenery at a more leisurely pace. Though it can be a brisk walk, too. There’s no reason you can’t get around here in 3 hours, which I think is something as Southern California golfers we can all appreciate. 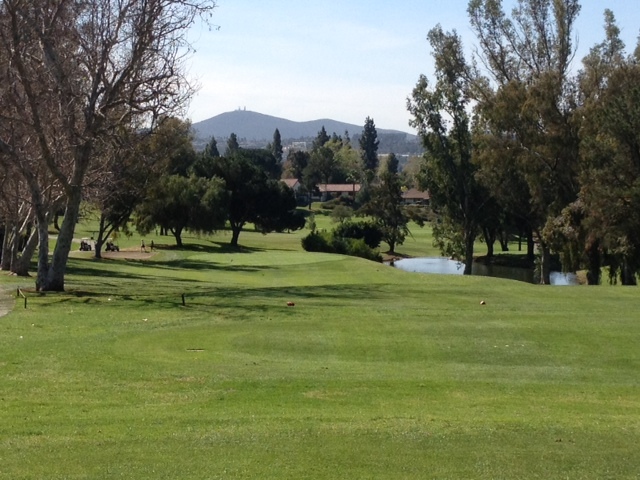 This entry was tagged frozen Snickers, JC Golf, Oaks North, Rancho Bernardo. Bookmark the permalink.